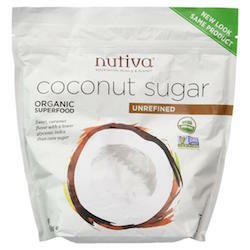 Nutiva Coconut Sugar Unrefined 1 lb. Nutiva's Organic Coconut Sugar is made from fresh coconut tree sap that is collected from the cut flower buds. The sap is heated to evaporate moisture, resulting in the crystal or granular form of sugar.